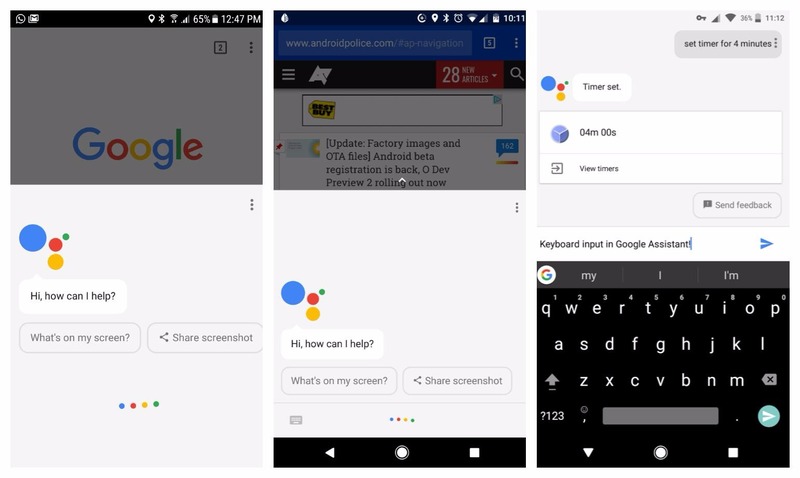 At Google I/O 2017, Google announced that Keyboard Typing will be coming to Google Assistant. So, today the feature is starting to show up for some users when they launch Assistant on their phones. Not everyone is getting this feature currently, but if you do, you will get an icon at the bottom left which shows a keyboard when you say, "OK Google," or when you tap and hold on your device's home button. Tap it and a keyboard will pop up to let you ask any question or issue any command in writing without saying a single word. Left: no keyboard icon as was always the case. Center: new keyboard icon for typing, Right: Typing Commands. The corresponding Google Assistant support page has been updated which mentions that you can now type in the Google Assistant. This feature is not rolling out for everyone, but it will be in the future. Keep an eye on yours and let us know!